Andrea Pirlo claims Inter play better with Lautaro Martinez in the side, while suggesting Mauro Icardi's position at San Siro has been weakened by his continued absence. Icardi has not played for the Nerazzurri since he was stripped of the captaincy in February amid a contract wrangle between the club and his wife and agent Wanda Nara. But Martinez has seized the opportunity to establish himself as a key man in place of his compatriot, starting Inter's last five Serie A matches and taking his goals tally to six for the league season. And Pirlo, who played for Inter before enjoying a storied career with AC Milan and Juventus, does not believe Icardi is helping his situation by remaining unavailable for selection. "Inter keep playing and those who do not play are losing value," Pirlo told La Gazzetta dello Sport. "Inter have another attacker. "How will Icardi return after being out for so long? 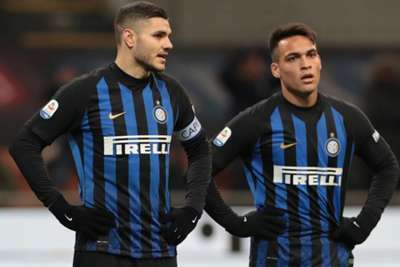 "Lautaro is more complete and makes the team play better, whereas Icardi is more of a goalscorer. But they can play together." Pirlo added that Nara had also negatively impacted Icardi's standing in Milan by allowing the saga to play out in public. "The representatives go to the office, they talk, they solve things in there," he said. "There would have been less mess if everything had been less public, less on social media." Icardi has scored just nine goals in Serie A this term, having netted 29 in the 2017-18 campaign.